Please contact Honu Spa directly. Parking is available at King Kamehameha Hotel. Visit our contage page for more information. Want more information on massages? Feel free to contact us! Every session starts with a consultation to discover what's best for you and your body. Using a combination of various techniques along with our premium products, your session will end with you feeling renewed and revitalized. Below are samples of the techniques we will use to create your customized massage. 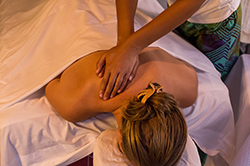 Swedish massage is a very gentle, relaxing and superficial massage providing a moderate pressure. If it's your first time or you don't get massage very often, Swedish massage is the perfect massage for you. Lomi Lomi massage is a Hawaiian traditional massage that uses the palms, forearms, elbows and knees. It's also known as a healing massage. 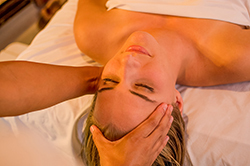 Lomi Lomi massage is rhythmic and sometimes dynamic like floating on waves, healing mentally and physically. This massage is also perfect for those who have never received a professional massage. Deep Tissue massage approaches deeper tissue and muscles as it stretches your body. It breaks up acute and chronic knots and loosens up the tension in muscle. Deep tissue massage affects the mobility of your body and this is a real customized therapeutic massage. Balinese massage is a Indonesian traditional massage including accupressure(Shiatsu), reflexology,tapping and aromatherapy. It promotes the flow of blood, oxygen and energy(qi) throughout the body. 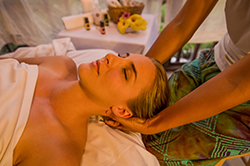 You will find a deep relaxation and all five senses are stimulated by a Balinese massage. Shiatsu is a Japanese traditional massage that uses fingers and palms. It is a massage without oil given while draped with sheets. Shiatsu massage balances the flow of energy(qi) and improves circulation and mobilization. Reflexology engages specific points on the feet and hands. It has beneficial effects on organs, glands and general health. Reflexology balances the nervous system and releases stress and pain.